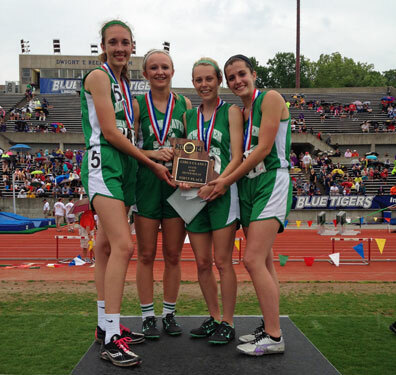 The 4x400 meter relay team of Hannah Pruessner, Molly Munsinger, Taylor Covington, and Rachel Steinhoff stand on top of the podium hold a Missouri State Championship Plaque. JEFFERSON CITY, Mo. 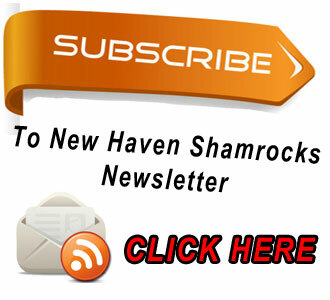 - The saying that “things come in threes", great things in this case, could not have been more true for New Haven at last Saturday’s State Track Meet after the boys and girls’ teams combined for three State Titles in three different events. JEFFERSON CITY, Mo. - “Taylor Covington had a great meet this weekend. 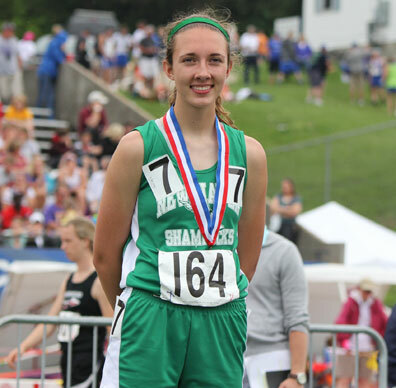 She ran in four events (400m, 800m, 4x800, and 4x400) and rarely do you have someone walk away with four state medals, one of them being a State Title, it’s exceptional”, said Coach John Tucker. Covington’s All-State performance was more than rare it was historical. The last time New Haven had an athlete place in all four events at state was Laura Brandt in 2002. UPDATED Results: Monday May 26th. JEFFERSON CITY, Mo. - Seth Schenck ends his illustrious career with a State Championship in the 800 meter run for the second straight year. 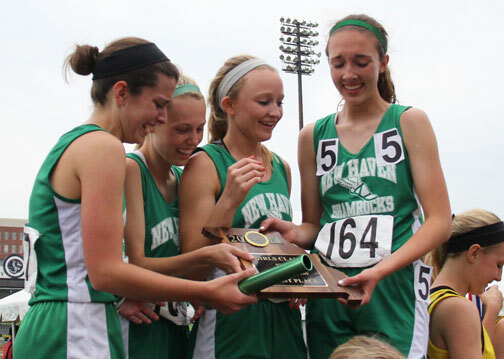 Then it was New Haven’s girls 4x400 meter relay team who topped off the day running a season best of 4:09 and a State Championship. JEFFERSON CITY, Mo. 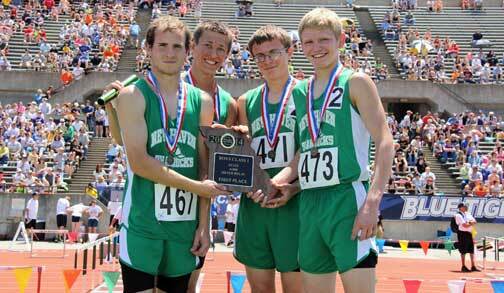 - New Haven kicked off the 2014 State Track Meet with a State Championship in the Boys 4x800 meter relay made up of Zach Grater, Jon Stone, Keven McDowell, and Seth Schenck, running a time of 8:20.76. Ereka Bailey breaks school record in the triple jump and long jump. PRINCIPIA HIGH SCHOOL - Seth Schenck continued his dominance in the open 800 meter by shattering his own school record by two seconds, running a 1:57.89, but Schenck was not the only one breaking school records. 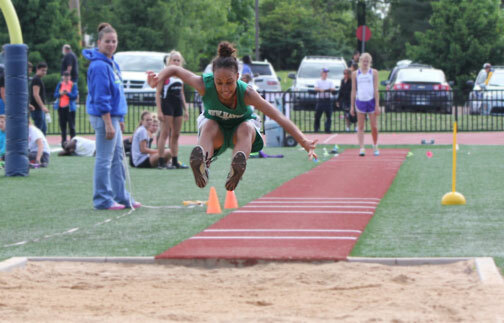 Sophomore Ereka Bailey advances to the State Track Meet for the first time after breaking the school record in the Long Jump (15-08.25) and Triple Jump (33-08.25), placing third in both events. Principia High School - QuickNewsNow will be posting live updates from today’s State Sectional Track Meet. 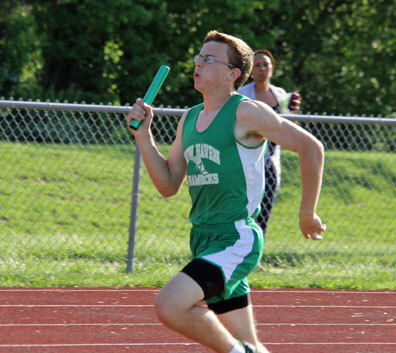 The top four in each event will advance on to next Friday and Saturday’s State Track Meet in Jefferson City, Mo. **Ereka Bailey breaks school record in triple jump, 33-8.25, finish third to advance to state.